Peter Moore, president of EA Sports and never one to shy away from controversy, has explained what he feels are the "core issues" surrounding the publisher's decision to drop the majority of its coming releases from the PC platform. 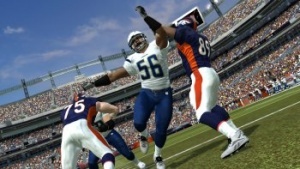 In June, Moore revealed that along with Madden NFL, the company's NCAA Football, NASCAR, Tiger Woods PGA Tour and NBA Live franchises would be not released on the PC in 2008, leaving only the FIFA and NHL titles available to gamers without consoles. At the time, Moore said EA Sports would "continue to explore new ideas for reinvigorating the PC platform for sports," and said the company had no intention of abandoning the platform, but the announcement nonetheless created an uproar among the PC gaming community. In his latest blog post, Moore said that despite being compared to "the devil incarnate," he would attempt to explain the issues behind the decision. Apologizing for the "apparent heartache" the decision caused to many PC gamers, Moore touched on numerous topics including changing business models in PC gaming as well as the demand for a return on investment in major development projects. "The PC as a platform for authentic, fully-licensed, simulation sports games has declined radically in the past three years as the next generation consoles, with their high-definition graphics and 5.1 sound capabilities have attracted millions of consumers to eschew the "lean in" PC sports experience for the "lean back" full room console experience," Moore said. "I know this concept touches a nerve with some of you, but our industry is founded on publishers that have driven for financially-successful games and then reinvested the proceeds in development of even more content for gamers to enjoy," he continued. "It's a simple financial premise, and an obligation for publicly-traded companies who answer to their shareholders. We are not making games in garages or bedrooms anymore." Sticking with opinions that would "touch a nerve," Moore was also quick to blame illegal copying as a major factor behind the decision. "Piracy is an issue," he said. "Sorry, I know many of you disagree with me on this, but the numbers don't lie. Companies spend millions developing content, and deserve to see a return on their investment for their risk. The employees developing the game design, writing code and creating art deserve to get paid for their work. Period." "That does not mean that we aren't coming back next year with new, innovative, maybe even less-expensive ways to play all of our franchises on the PC," he added, "but for right now we are assessing all of the options open to us to shift the current paradigm for our games on this platform."